Outfielders — Gino Cimoli (9), Don Demeter (27), Jim Gilliam (19), Bert Hamric (51), Duke Snider (4). *Lions won the Pacific League Championship and defeated the Giants, who won the Central League Championship, in the Japan Series, 4 games to 2. PRELUDE: Early in 1956, the Dodgers were invited by Matsutaro Shoriki, the founder of the Yomiuri Shimbun and the “father of Japanese professional baseball,” to make a trip to Japan following the regular season. It was Walter O’Malley’s desire to accept the invitation and have the Dodgers make the goodwill tour to further international relations. He spent time to ensure the key Dodger players would make the trip before responding. 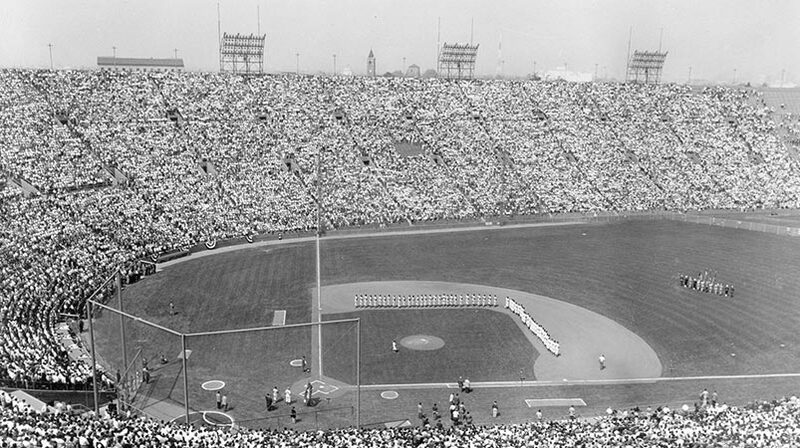 The Dodgers were at the height of their popularity, having won their first World Series Championship in 1955. Shoriki dispatched renowned Yomiuri sportswriter Sotaro Suzuki to New York to meet with O’Malley and personally act as his representative to make all necessary arrangements for the Dodgers to make the goodwill tour, sponsored by the Yomiuri Shimbun. The plans for the trip were announced publicly by O’Malley on September 9. John M. Allison, U.S. Ambassador to Japan, issued a statement just before the Dodgers arrived in Japan. U.S. President Dwight D. Eisenhower authorized Allison to say that baseball has become “a regular and significant event in Japan’s relations with the United States.” Allison added, “This visit to Japan by one of America’s most notable baseball teams is an outstanding example of the many mutual interests shared by the people of Japan and the United States, the two nations which regard baseball as a national sport. It is but one of the many exchanges by which the two countries further their good relations and understanding.”Bob Bowie, Stars & Stripes, October 18, 1956 The Dodgers tuned up for the Japan games by playing three exhibition contests in Hawaii, one in Kahului, Maui and the final two in Honolulu. They defeated the Maui All-Stars, 6-0, the Hawaiian All-Stars, 19-0 and the semi-pro champion Honolulu Red Sox, 7-3 in 10 innings. The Dodgers then left Honolulu on October 16 en route to Tokyo. They had a five-hour layover, due to a tire problem with their chartered plane, on Wake Island. The Dodgers, however, made the best of it as Wake Island declared a holiday and schools were closed and children flocked to the airport and everyone turned out to greet the Dodgers to their tiny coral atoll.AP story in Asahi Evening News, October 19, 1956 Due to their delayed late-afternoon arrival in Japan, the Dodgers cut short a welcoming reception at Tokyo’s Haneda Airport before a crowd of 3,000, mostly school-aged children, as they had to prepare to play the Central League Champions at Korakuen Stadium the next afternoon. Despite drizzle, some 100,000 enthusiastic onlookers lined the streets to watch the 67-person Dodger delegation in a 26-car motorcade travel from the airport though downtown Tokyo to the Imperial Hotel. A game-by-game recap follows.